If you have one symphonic metal band, why not create another one? That appears to be what Operatika band members guitarist Richard Fischer and keyboard player Boris Zaks intended with the creation of Midnight Eternal. It's another female-fronted symphonic power metal band featuring newcomer Raine Hilai. There's only one problem. Bands like these aren't very popular in the States. It's no wonder then that Midnight Eternal's self-titled debut lands with European label Inner Wound Recordings. The other thing that's problematic is that there's a gushing overflow of similar bands. The obvious comparisons will be to Nightwish, Delain, Epica, After Forever, to name only a smidgen of similar bands. And the comparison would be correct. The next, also obvious, question is, what does Midnight Eternal have that might, just might, set them apart? Not much. Ms Hilai demonstrates a melodic and clean vocal range from classic rock and metal to operatic, leaning more to the former (which I prefer). But that's not new. Midnight Eternal also has synth symphonic layer embellishing power riffs for a huge bombastic sound. Again, as expected. After this, what else is necessary? Rumbling and roaring rhythm section. Yep. Occasional frosty keyboard solos. Of course. Flaring and soaring guitar solos. Check and mate. Again, it's everything you would expect in a symphonic metal band. Though not different than some bands, Midnight Eternal does seem to lean more to the heavy and power metal side of the equation. Songs such as Like An Eternity, Repentance, Signs Of Fire, and Shadows Fall are blistering, sincerely guitar-driven songs moving at a brisk pace. Then in the center of the album, with Midnight Eternal, When Love and Faith Collide, and especially Believe In Forever, you'll find the band bumping up the rock groove, adding more than a little arena-ready AOR accessibility to their power metal. Again, it's been done before but, to their credit, Midnight Eternal does it with same acumen and enthusiasm as their most noteworthy peers. So, in the end, what impressed me most were the song arrangements and the proper balance of musical elements within each, Ms Hilai's less operatic, more straight forward rock and metal voice, and the abundance of strong guitar work. For Midnight Eternal, it's a perfect storm which makes them sound terrific, and maybe, just maybe, allows them to shake things up in the genre. Recommended. 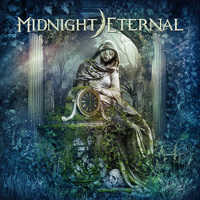 What impressed me most about Midnight Eternal and their debut album was the song arrangements and the proper balance of musical elements within each, Ms Hilai's less operatic, more straight forward rock and metal voice, and the abundance of strong guitar work. It's a perfect storm which makes them sound terrific, and maybe, just maybe, allows them to shake things up in the genre. Recommended.